A much better weekend weather wise this time around after last Sunday saw all the FAWPL games across the Southern & South East Division One called off. Still a couple of games not making it this time around in the South with Chichester City Ladies and Lewes FC Women postponing their league fixtures. Leaders Charlton Athletic Women extended the gap at the top to 5 points with a large away win against bottom side Swindon Town Ladies. Top scorer Charlotte Gurr scoring as early as the 2nd minute for the visitors a 35 yard strike from Charley Clifford seeing Charlton 2-0 within 10 minutes. Gurr added another midway through the 1st half with an own goal 2 minutes from time seeing Charlton lead 4-0 at half-time. On the hour Charlton were awarded a penalty kick Gurr stepping up to score and complete her hat-trick. 5-0 the lead going into the last 10 minutes of the game Charlton finishing strongly, new signing, Olivia Lukasewich scoring a goal on her debut for the club. Georgia Griffin making it 7-0 on 83. Gurr scoring her 4th of the game her 27th so far this season in the last minute. Time in injury time for one more goal Kit Graham on target for her 21st goal of the season in a 9-0 win. The big game of the weekend however was between 2nd placed Crystal Palace Ladies away to 3rd placed C&K Basildon Ladies to gap 3 points. Basildon with a 100% record at Canvey Island are a tough side to play, Angela Addison with her 16th goal of the season giving the hosts a 1-0 1st half lead. Further chances 2nd half for both sides but defences came out on top Basildon claiming the 3 points to move level on points with Crystal Palace with a game in hand. Elsewhere it was 8th versus 9th as West Ham United Ladies headed across to Wales to take on Cardiff City Ladies. Goals from Rosie Kmita and Ellie Zoepfl seeing the visitors leading 2-0 at half-time. Kmita scoring again early in the 2nd half to put West Ham into a 3-0 lead. A crazy 15 minute spell then saw a further 5 goals scored followed Kelly Weathall putting West Ham 4-0 up, Cardiff hitting back to make it 4-1 Kelly Issac scoring. Zoepfl scored her 2nd of the game to restore West Ham’s 4 goal cushion before Estelle Randall scored for the hosts to make it 5-2. Chloe Gurr recently introduced from the subs bench finding the back of the net to seal a 6-2 win for the visitors the 3 points taking them into 8th above Cardiff. One game left to play in the last 16 of the FAWPL Cup. After 3 previous postponements due to the weather it was finally game on between South East Division One side Cambridge United WFC at home to Southern Division side, Coventry United Ladies. A tough test for Cambridge, Coventry coming into the game off the back of 6 straight wins in league and cup. 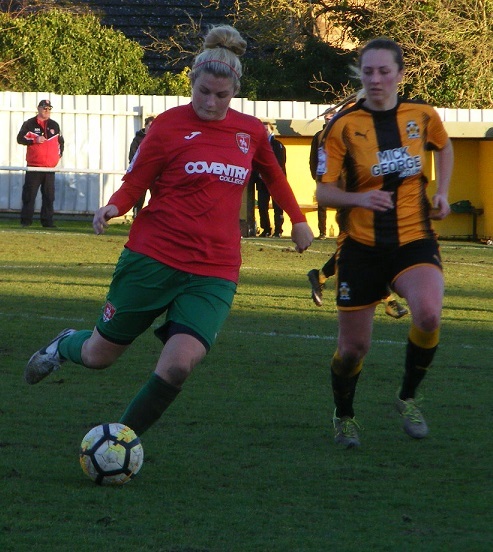 It was the visitors who started the stronger putting Cambridge under immediate pressure resulting in a early goal Alison Hall heading in a Marie Gauntlett cross in the 9th minute. Coventry had chances to go further ahead but some excellent saves from on loan goalkeeper Shayla Burgess kept the score down to 1-0 at the break. A chance for Cambridge to regroup, Coventry started the 2nd half just as strong as the 1st doubling their lead early on with Jade Brook sending the ball home to make it 2-0. On the hour mark Natalie Haigh up from the back powered the ball home from a header to make it 3-0. With Cambridge pushing up the field in the latter stages of the game the visitors them on the counter the ball played forwards Burgess racing out of her box to head the bouncing ball away can only put it into the path of the advancing Brook, 40 yards out goes for the lob the ball finding it’s way over the line for her 2nd of the game. 2nd half substitute Jessica Lundie scoring in stoppage time to secure a 5-0 and an away trip to Plymouth Argyle Ladies in the quarter finals. 3 games played in FAWPL South East Division One this weekend. League leaders AFC Wimbledon Ladies winning their 12th game of the season to maintain their 5 point lead at the top of the table. A home on Sunday playing Enfield Town Ladies the score was 0-0 at half-time. Wimbledon opening the scoring early in the 2nd half a minute played Laura Quinn-Low making it 1-0, 10 minutes later Quinn-Low netted her 2nd of the game to extend Wimbledon’s lead. Enfield pulling it back to 2-1 with 3 minutes left to play Katherine Long on target the hosts holding on for the win. It was 2nd versus 4th in South East Division One on Sunday with Leyton Orient WFC hosting Ipswich Town Ladies. Top scorer Sophie Le Marchand scoring in the 1st half to give the hosts the lead. Ipswich levelling the scores 4 minutes before the half-time whistle their top scorer, Natasha Thomas scoring the goal. A close contest the winning goal coming on the hour Le Marchand with her 19th goal of the season securing a 2-1 win for Leyton Orient moving them 4 points clear of 3rd placed Milton Keynes Dons Ladies and putting a big dent into Ipswich’s own title ambitions in the process. A huge game at the bottom of the table with the bottom 2 meeting each other on Sunday. Haringey Borough Women still looking for their 1st point at this level hosting Norwich City Ladies who themselves have just the 4 points on the board knowing 3 points were a must if they have any home of catching the sides above them. Vivian Moyo with the goal 10 minutes from half-time to see Norwich hold a narrow advantage at the break. Turning out to be crucial as Haringey scored 3 goals in the 2nd half, Julia Carruthers netting a brace along with a goal for Jonea Peter. Norwich also finding the back of the net for 3 goals themselves in a dramatic 2nd period, Moyo with her 2nd of the match. Sasha Diston getting a goal on 70 minutes with Chelsea Garrett scoring with 7 minutes left to win it 4-3 for Norwich moving them onto 7 points. This entry was posted in FAWPL Cup, FAWPL South East Division One, FAWPL Southern Division, The Round-Up and tagged FAWPL Cup, FAWPL South East Division One, FAWPL Southern Division, The Round-Up on January 30, 2018 by WFEast.